The S.I. 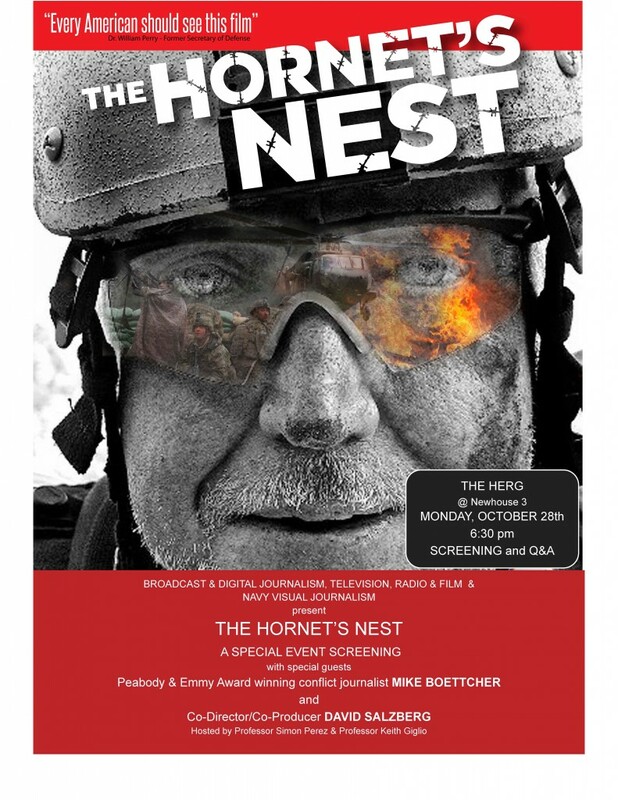 Newhouse School of Public Communications will host a screening of the documentary film “The Hornet’s Nest” on Monday, Oct. 28, at 6:30 p.m. in the Joyce Hergenhan Auditorium in Newhouse 3. Director and producer David Salzberg will attend the event along with one of the film’s subjects, Mike Boettcher, a Peabody and Emmy Award-winning journalist. A Q&A with Simon Perez, assistant professor of broadcast and digital journalism, will follow. Journalists Boettcher and his son, Carlos, were embedded with U.S. forces fighting in Afghanistan. The film is billed as “a true story of survival not only for the soldiers but for a father and son who seek to rekindle their relationship under the most harrowing of circumstances.” The film provides unprecedented access to the longest war in U.S. history. A veteran network news correspondent, Boettcher has received journalism’s top awards and national recognition in all facets of broadcast journalism—breaking news, feature, war coverage and investigative reporting. He has been honored for his investigations of the world’s most dangerous terrorist groups. As the chief correspondent for CNN’s terrorism investigation unit, a team he created in the summer of 2001, Boettcher was awarded a Peabody and his third of six national Emmys. On June 1, 1980, he helped launch the era of 24-hour live news coverage when he performed the first live satellite report for a fledgling CNN. For more information about the screening, contact Keith Giglio at 315-443-3475 or kegiglio@syr.edu or Simon Perez at 315-443-9253 or jsperez@syr.edu.